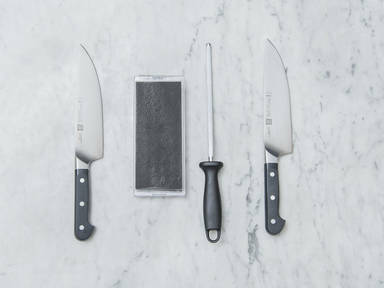 To sharpen a knife with a sharpening steel, start with it top down on a secured cutting board and hold firmly. Place the back of the blade (nearer the handle) at the top of the sharpening steel at a 15° angle. Pull the blade from the top to the bottom, gliding the tip of the blade toward you as you pull lightly, and evenly. Repeat on both sides approx. 10 times. To use a whetstone, first add water to the lid of the whetstone—or if your whetstone does not have a lid, use a large flat dish—and soak the coarsest side of the stone until there are no dry spots visible. Place the whetstone coarse side up, and, if necessary, secure as you would a cutting board. Hold the knife at a 15° to 20° angle and pass the knife over the stone with light even pressure, alternating sides. Turn the whetstone onto the fine grit side (also soaked with no dry spots visible) and pass the knife over as before. For an extra sharp cut, you can finish with an even finer grit using the exact same process.